Our rifle mule deer hunts are conducted in Alberta's top producing Mule Deer zones. We offer rifle mule deer hunts in the the rural and public forested areas NW of Calgary that lead into the eastern slopes of the Canadian Rocky Mountains,the rolling foothills SW of Calgary and the expansive prairies in south eastern Alberta. No other outfitter approaches Trophy Hunters Alberta on hunt flexibility and overall Mule Deer success and every year we have amazing success with our Mule Deer hunters. 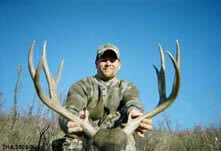 Our open country spot and stalk hunts in the Foothills and Prairie are the most popular hunts. Hunters can generally expect to experience several harvest opportunities. Devin Rump - Another 100% THA Harvest! 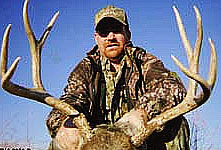 Our guides are all experienced hunters/guides who live and hunt in, or near, the area in which they are guiding. By utilizing experienced, respected local guides, access to thousands of acres of private ranch properties becomes available to THA hunters. Our mule deer guides have harvested dozens of book animals over the years with our hunters. They know how to adapt to your hunting style and get on the big mule deer. We offer three distinct types of rifle Mule Deer hunts as summarized below. These hunts are operated in Alberta Foothills WMUs 318, 320, 322, 324, 326, 330, and Mountain WMU 429 in the wonderful forested rural and crown areas SW, west and NW of Calgary and provide a high success probability for our hunters. Although our hunters in the 'Bush' hunts will not see the quantity of mule deer that they would see on our Foothills 'Trophy' hunts, there are still serious trophy muleys in these zones where, because of the habitat and terrain, they are able to seek cover and to survive many hunting seasons. Ground blinds, tree stands and limited spot & stalk are the preferred methods to hunt these dark-horned monsters. The spruce rubbed antlers of the bush mule deer are much darker than their open country poplar rubbed cousins encountered on the Foothills 'Trophy' hunts in WMU 304 / 305 and the prairie WMU 100x zones. Transportation during these hunts is provided by THA and is generally by 4x4 with limited to extensive walking required depending on your level of physical fitness. Hunters should be prepared for extensive time in a 4x4 as it is essential that we keep on the move always attempting to find the next monster. Accommodations are at a full service lodge (the Grandview Stage), a ranch, B&B or local motel. These Mule Deer hunts can occur anytime from the season opening on September 17 until the end of November. Many hunters prefer to hunt the 'Bush' muleys during the early season when they have not been rifle hunted for many months and remain largely undisturbed. The season for these hunts is from September 17 to November 30. 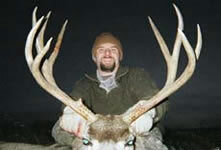 Hunt big game Mule Deer with Trophy Hunters Alberta in some of Alberta's finest Mule Deer areas, namely the foothills area of southwestern Alberta, the eastern slopes of the Canadian Rocky mountains and the prairie giants in the south and east. 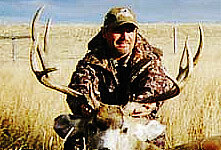 It is not unusual to see hundreds of mule deer, and hopefully a few in the world class keeper category in these zones. These 6-day 'Trophy' foothills mule deer hunts are operated in WMU 304 and 305, one of our most productive mule deer areas in Alberta. These WMUs are located in the beautiful Porcupine Hills SW of Calgary and over the last 10 years we have experienced 100% harvest on mule deer averaging 160 B&C. Many hunters have reported seeing in excess of 100 mule deer per day. On this hunt, we expect to see numerous 140 class mule deer and every year harvest several muleys that score in the 170 to 190+ range. You will hunt on extensive ranchlands in an area where an average ranch is about 4,000 acres. These are almost exclusively spot & stalk hunts with extensive ground coverage in a 4x4 glassing the many hills, draws, coulees, river bottoms, etc. for the biggest mule deer we can find. We should see lots of bucks and the decision will be yours as to whether or not this is the deer for your next stalk. Transportation during these hunts is primarily by THA 4x4 with limited to extensive walking required depending on your level of physical fitness. The better your physical condition, the more unexplored territory you can cover. Usually we have access to horses, ATVs and snowmobiles, when they are required, to retrieve a downed mule deer from a difficult situation. Accommodations are at a working cattle ranch, a guide's home, a B&B or a local motel. Guiding is 2:1 with optional 1:1 guiding available at an additional cost. The season for these hunts is from October 25 to November 30. These 4-day 'Trophy' prairie mule deer hunts are our highest demand hunts for Alberta's largest trophy mule deer and are operated in the wide open prairies of southern (WMUs 104, 106, 110 & 134) and eastern (WMUs 160) Alberta. Hunting is only allowed Wednesday through Saturday during each week in November, so these hunts are definitely action packed hunting experiences where a hunter typically sees lots of bucks and usually some serious trophies. The extremely limited number of allocations available for non resident hunters coupled with the very limited draw opportunities for Alberta residents make these hunts the most desirable, high demand mule deer hunts in Alberta due to the very limited pressure on the muleys. For example, WMUs 104 and 106, two massive zones in the SE corner of the province each have only 2 mule deer rifle allocations available and THA owns all four. As a result, THA owns all the mule deer allocations along the southern border with Montana from the SE corner with Saskatchewan to about half way across the province. On these hunts, each hunter has a dedicated guide for his own private and thrilling hunt. There are lots of mule deer and some very serious trophies. Spot & stalk is the preferred method to hunt these monsters. Transportation during these hunts is by THA 4x4 with moderate to extensive walking required depending on your level of physical fitness. Accommodations are at a ranch, B&B or local motel. During these hunts, we will do lots of spotting, walking and careful, planned approaches in open country. We conduct these hunts Wednesdays, Thursdays, Fridays and Saturdays during November, the only days open for hunting these prairie giants. The season for these hunts is from November 1 to November 30 (Wednesday to Saturday ONLY). Mule Deer hunts are our specialty!